I was quite surprised by a posting I saw on Flickr.com by Brian Solis and Jess3. 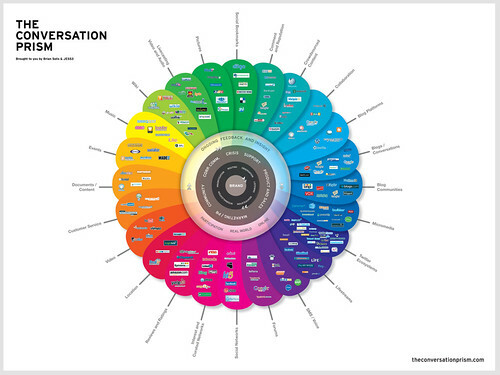 It was a poster titled “The Conversation Prism” that breaks down every current social media network into various categories. The thing is massive. Check it out. It would take a full day just to investigate every site listed there, and that’s why it is important to choose carefully the right social networks to be involved with. Each network has its own pulse, purpose and body of users. That’s why Janet Fouts writes in Social Media Success!, “You’re going to want to identify where people are talking about the topics you are interested in, what types of networks they are using and where the biggest concentration of interest is.” (Fouts, 2009, p 37). This way, a designer can join a discussion that is already underway, to glean information from it, or add value to it. As far as social media being able to help a designer, one of the best helps I’ve found is to follow and listen to many professional designers and organizations who are far more skilled and knowledgeable than I am. This allows me to partake of their collective knowledge of design, and get different points of view on every aspect of design. By using a service like Twitter to listen in to what industry professionals are talking about and doing, I’m gaining a first-class education in my off hours – almost like an internship. After all, there’s much to learn. Some designers have dedicated years of their lives to only typography, or book cover design (like some of the new AIGA Medalists (Lynda.com, 2010)). These designers have a wealth of knowledge that, if freely given through links on Twitter, other designers can benefit a lot from. Several cases have been reported of Southwest Air and Jet Blu where someone was standing in line, late for their gate at the airport and complaining on Twitter. Someone who was listening for the airline on Twitter caught it in real time, contacted the ticket counter and resolved the situation on the spot…People beginning to actually expect this kind of service, and if you don’t provide it they’re going to look for someone who does. (Fouts, 2009, p 41). This kind of active listening on Twitter, and other kinds of active engagement with users through other social media avenues, will greatly improve all aspects of consumer life. Companies will once again have to compete with each other to provide the best service in order to stay competitive, and customers will reap the rewards of companies who remember to serve them, rather than just make a profit. After all, quality products and customer service pave the road to profit. Social media channels are perfect for grassroots organizers to quickly create buzz and find their following…One of the most powerful things about social media networks is how easy it is to get into a conversation…Is this the future for non-profits? I Think it will be. Raising awareness of a cause is a significant aspect of the mission of most non-profits and that aspect can be as much as 25-30% of their administrative costs…Social media allows organizations to leverage the networks of their supporters to reach much further than by traditional means. (Fout, 2009, p 125-128). For non-profits, leveraging their networks of followers to influence their followers will help spread the non-profit’s message like wild-fire. Word-of-mouth, user-to-user interaction always works faster and more efficiently than traditional marketing posters, flyers, or mailings. For non-profits, social media could completely turn around their whole organization. Do you have any more ideas about the benefits of social media and social networking? What kinds of benefits have you experienced? What do you love or hate about social media? What do you want to see improved? Any visions for the future? Fouts, Janet. (2009). Social Media Success! Silicon Valley, CA, USA: HappyAbout.